#9 at North Freedom, October 14, 2000. Paul Swanson photo. 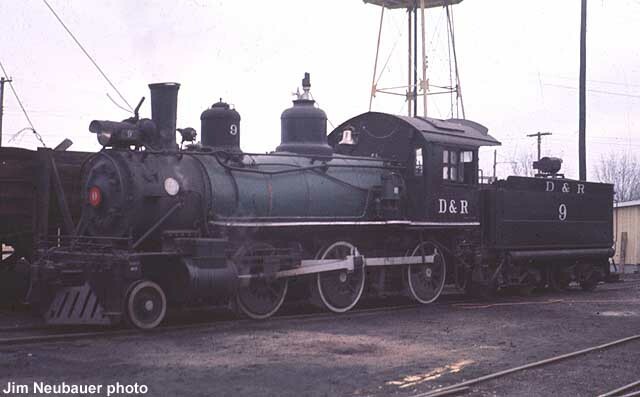 #9 at Dardanelle, Arkansas, August 1957. Paul Swanson collection. 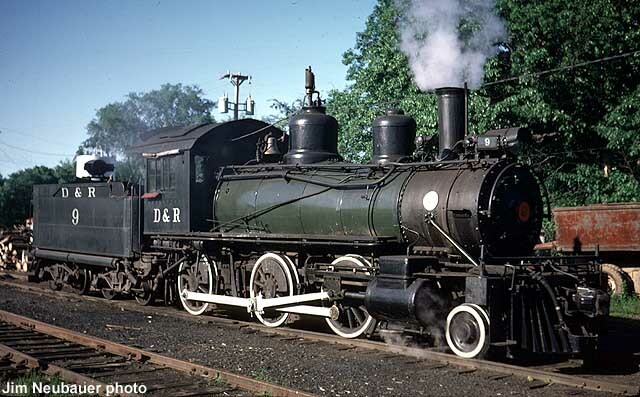 The oldest locomotive at Mid-Continent, #9 came from Burnham, Parry, Williams & Co. (commonly known as Baldwin) at Philadelphia, Pennsylvania in 1884, as New Orleans & North Eastern #232. She received a new wagon-top boiler when rebuilt in 1904. 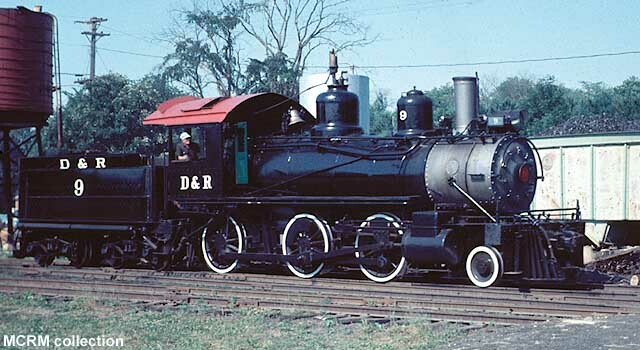 NO&NE sold her in 1917 to a surplus equipment dealer, which in turn resold her to the Dardanelle & Russellville. The locomotive, renumbered #9, served the Arkansas line until 1963, when Mid-Continent bought her with the help of a major donation from Elliot Donelly. #9 was moved to the museum on her own wheels and quickly put into service. Having suffered damage from an accident in the 1950s, she had been rebuilt by the Missouri Pacific and received a steel pilot at that time. After arrival at North Freedom, museum crews replaced the pilot with an older wooden pilot. #9 served as the main duty engine in the 1960s and 1970s until she was sidelined with a tired and leaking tender. Crews liked #9 for her smooth ride, easy firing, and fuel efficiency. She was returned briefly to service in 1991 for one summer with a temporary tender, but is again waiting her turn in the shops, this time requiring boiler work and a new tender.